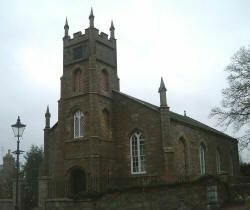 Udny Green church (architect John Smith) was built in 1821 to replace the original ‘Christ’s Kirk’ on the opposite side of the Green. In the churchyard where the latter stood there remains a circular morthouse built in 1832 to foil any attempts by graverobbers. The present church has a square tower with a Thomas Mears bell (1821) and a clock gifted in 1895 by Mrs Amy Udny. The interior of the church, with its U-shaped gallery, was remodelled in 1890 and on the north wall there are several commemorative tablets to members of the Udny family. The stained glass window, which depicts St Machar and Dorcas, was given in memory of Mrs Udny by her husband. The pipe organ, installed in 1889, is a Harrison and Harrison. The war memorial, a granite figure of an infantryman, stands to one side of the church and behind it lies a Memorial Garden.